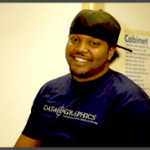 UL Approved Labels | Data Graphics Inc. UL Approved Labels | Data Graphics Inc.
With more than 30 years of experience as a leading label producer, Data Graphics is fully authorized to print UL approved labels. We are an authorized label supplier as part of the UL’s Authorized Label Suppliers Program. As a certified vendor, we can print your UL-authorized stamped layout or work with your classification/listing mark data page. 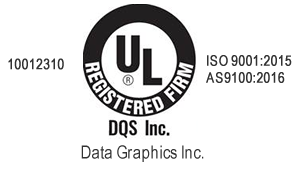 Data Graphics provides Type R (requires a stamped composition drawing or classification/listing mark data page) and Type L (requires an authorization order from UL with serial or issue/lot numbers), as well as any requirements you may have for PGDQ2 or UL 969 compliant labels. We primarily serve the military, medical, manufacturing, telecommunications and aerospace industries. We produce the highest quality UL approved labels for component suppliers and manufacturers of UL approved products from around the world, and our Sales Engineers are available to give you a quote. Whether your application surface is acrylic paint, aluminum, galvanized steel, porcelain, stainless steel, alkyd paint, polyester paint, acrylonitrile butadiene styrene, nylon or polyphenylene oxide/ether, Data Graphics has a material that meets UL Standard 969. We can also meet the UL label requirements for indoor or outdoor exposure, fuel oil no. 1, fuel oil no. 2 or gasoline. There are several ways to print UL labels. You can screen print, use flexography, digitally print or thermally print. UL labels must be durable and long lasting. The material you choose will depend on the product that needs the label. Polycarbonate plastic, vinyl and anodized aluminum are some of the most durable materials. Vinyl or polyester labels are most often used on electronic components, such as computer hardware, which emit constant heat. In other cases, the UL-approved labels must be able to tolerate moisture, corrosive chemicals and ultraviolet rays from the sun. Our staff is available to help you learn more about UL approved labels and which would be the most appropriate material and printing process to choose for your labeling requirements. We stand behind every label that we make. We are proud to produce UL approved labels for suppliers to our armed forces, our public safety members and our space program. Reach out to us for a quote on your label today.